Dreadlocks have become a very versatile and adjustable hairstyle of nowadays. They can be worn both by black and white men. The hair structure, length and color don’t affect the success of the result, unlike the proper maintenance and styling do. You can try on all the styles as your hair grows, or you can have in mind the ideal look and go for it. 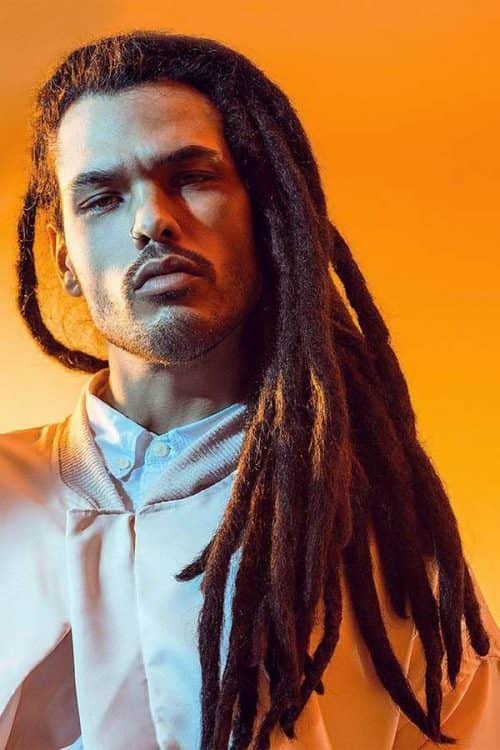 Dreadlocks, or as they are sometimes called locs or dreads, are still a highly requested hairstyle for men. They represent freedom and independence with an air of boho. However, to rock the style, you shouldn’t necessarily belong to any subculture nor have any specific skin color. You like it, you wear it – that’s the rule. If you are thirsty for a new dreadlock style, just keep on reading to find out how you can give it a go. Before giving you some insights into the dreadlocks history, we’ll address the question “What are dreadlocks?” This is a hairstyle, in which you after washing your hair, don’t comb it but twist the strands into ringlet or braids while they’re still wet. It’s been a long time since the first mention of dreads in Indian writing, around 3800 years. Locs were an attribute of cavemen, ancient Egyptians, the emperors of ancient Asia and many other notable ancient people, like Samson and John the Baptist. As for the history of dreadlocks name, it originated in Jamaica, the early Rastamen movement. It is formed of the word dread, which stands for horror and fear. Of course, you want to find out how to get dreadlocks, but first, you need to know how to dread hair. Begin with growing out your hair a little so that we would have something to work with. Then you need to start using a shampoo that doesn’t contain residues because they prevent hair from tangling and knotting. Besides the shampoo, you’re going to need some other dreadlocks making supplies, like a dreading comb, rubberbands, hair clips, a dread wax and a locking accelerator. With all these things in mind (and in your bathroom), you’ll be able to learn how to get dreads and how to do dreads very fast and easily. There are many ways how to make dreads, actually. Almost all of them require you to start with washing and air-drying your hair as well as dividing it into squares and securing with rubberbands. Twist and Pin method suggests twisting each section until it forms a ball. Using the Backcombing method, each section of hair should be teased toward the head. When the hair is dry, pull each section apart. Twisting requires you to twist each section to and fro between the fingers. Dread Braiding has a very literal name. You just need to braid each section of the hair. Brush Rubbing implies brushing and rubbing the hair clockwise around the head without dividing into sections. With Twist and Rip method, you first divide the hair into squares and only then wash it. 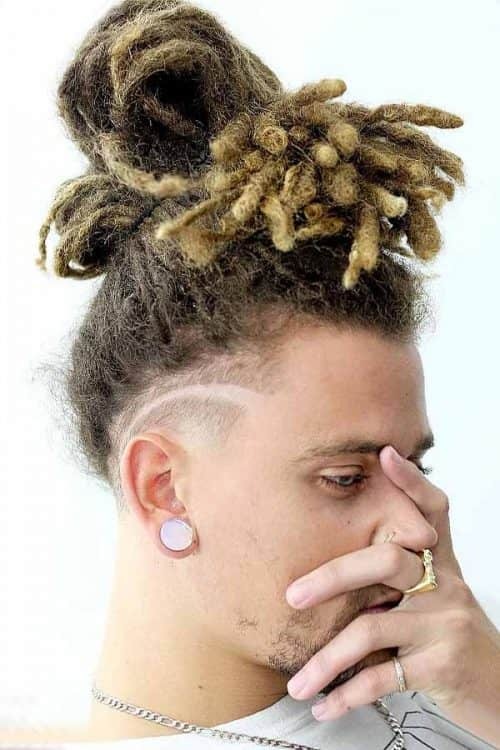 Freeform Dreadlocks is a low-effort method. You just do nothing special to your hair and wait until it’s locked. For the Dread Perm, you go to the salon and get your hair chemically ruined so that it could dread easily. Loomed Dreads method also requires going to the salon where you’re going to get dread extensions. As of today, the most effective and hair-friendly way how to make dreadlocks is backcombing. Basically, nothing much will change with your hair washing routine. Just wash your dredlocks at least once a week to maintain good hygiene. And again, use the residue-free shampoo, which means that the shampoo should not leave anything in the hair after rinsing. It’s crucial because the hairs become covered with residues, and this makes dreads loose. Moreover, when residues accrue in the locks hair gets prone to growing mold. Cut down on washing. Frequent washing will make your hair smooth, and thus, you won’t attain the fuzzy look you’re striving for. Go wild. Don’t limit yourself to one style. There are numerous dreadlock hairstyles for natural hair out there. And you can come up with even more. Get inspirited. Check out men’s hairstyle websites, fashion magazines or pages of celebs on social networks for hair inspirational ideas. Go eco. Use natural products only because they’ll keep your locs healthy. Keep backcombing. To refresh your hairstyle, you’ll need to tease your hair toward your scalp every now and then. Educate yourself. Learn how to dread in different ways, not only the one you’re sporting. Keep waxing. Use a special dreadlock wax to style and maintain your locs. Dreads have remained very popular until the present day. However, there are still many unjustified stereotypes about them. Two of them stand out the most. For some reason, people think that those who wear locs don’t wash their hair. But we know how much time and effort it takes to maintain the style. The second concerns affiliation with some religious or Rastafarian groups. However, in the modern world, practically anyone is allowed to wear anything they wish, and it shouldn’t mark an imprint on them. So, make yourself comfortable and jot down the best ideas for the dreadlocks hairstyles. 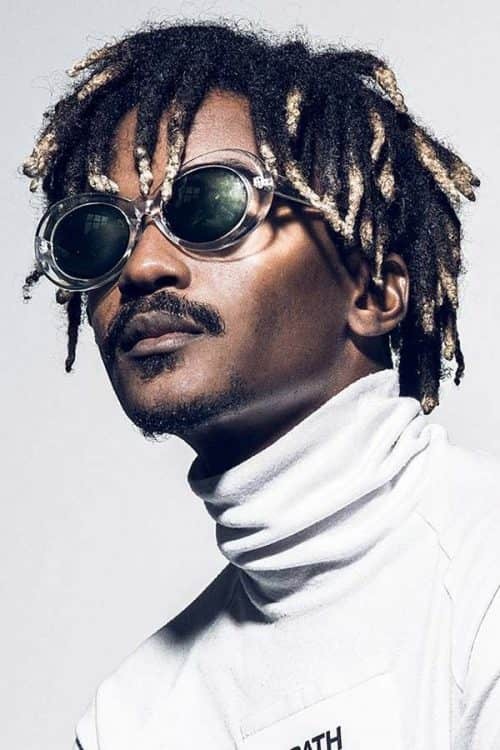 If this is your first-time locs and you aren’t ready to try too wild dread men’s long hairstyles yet, start with a classic hairdo. Just wear them loose, thus bragging about the thickness and length of your thatch. 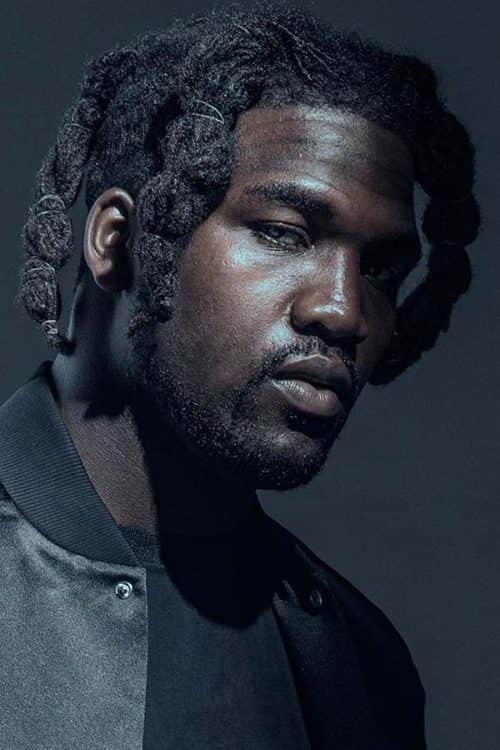 If you favor hip-hop, you probably thought about trying out the dread locks the artists prefer. Mid-length dreds fall freely around the head. To rock the look even more, add an ombre effect to the tips. 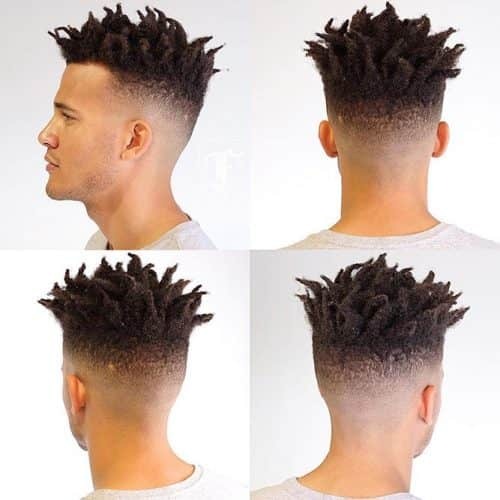 Paring top head freeform dreads with a high bald fade haircut is the most popular version of the look. If you want a cool and trendy but clean cut hairstyle, short dreads with a fade is your best choice. High top dreads are a very popular hairstyle for a reason. Thanks to their undercut design, they’re really low-maintained. Ask your barber to give your sides and back a taper fade, while the top should be left longer. To bring the look into the modern day, add a line-up and two symmetrical curved lines as a design element. 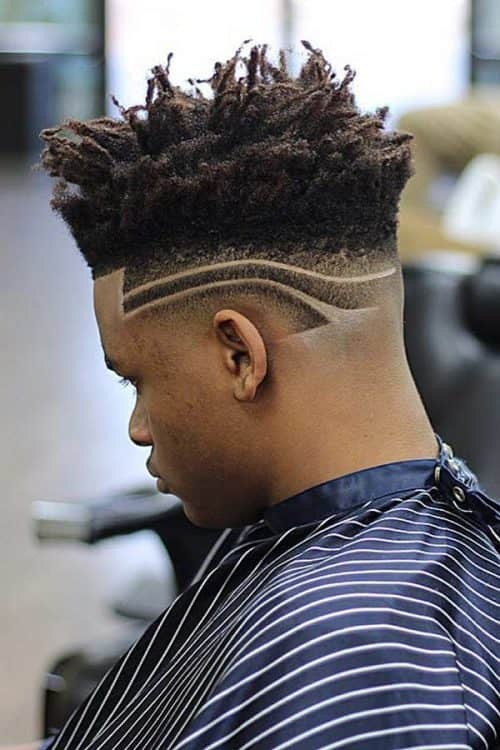 Mohawk haircut looks cocky and stylish in all its variations. Mohawk dreads are no exception. Wear them short or medium length with the burst side fade. Mohawk hair styles are so popular because they offer a lot of styling opportunities for the top, while the sides don’t require much maintenance. 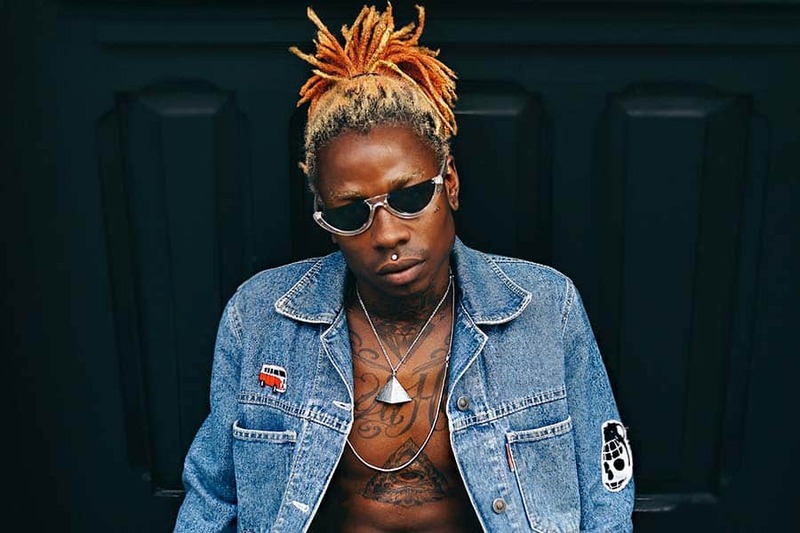 Even though short dreads aren’t as noticeable as other locs hairstyles, they have many benefits compared to longer dreads. Short dreadlocks can be managed, maintained and styled much easier than the long ones. We may surprise you, but dreadlocks can be curled in the same way like any other hairstyle. To add a little texture to your hair before curling, you can crochet dreads yourself or ask the professional locticians or dreadlocks artist to do it for you. 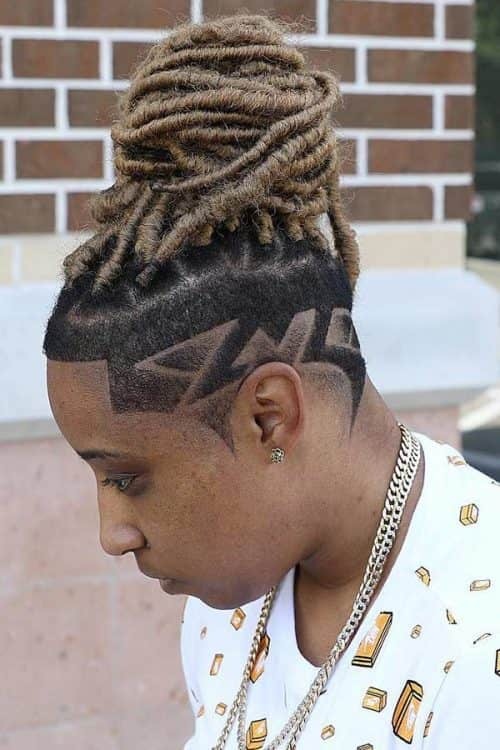 If you want to keep the focus on your dreadlocks only, it’s hard to imagine a better option than the undercut. The perfect length of the locks with tapered back and sides is medium so don’t’ grow out your hair too much. This hairstyle can be regarded as Asian dreadlocks by right. Asiatic people love pairing locs with tattoos. However, not only do they cover the whole body with tattoos but also shave the sides of the head and add a tattooed masterpiece there. Dreadlocks offer many styling options, which depend on the thickness, length and the way of wearing (i.e. loose, braided, gathered etc.). If you want to keep it neat and sophisticated, try a skinny dreadlock style. You can pair it with a connected beard to complete the look. People may find your hairstyle creative and elegant. They don’t know that a man bun is a perfect way to reduce the heaviness of the long dreads. Just kidding. Wearing your locs up really looks unusual and exquisite. However, it does give a relief of the burden you carry. Dreads gathered in a ponytail are a serious rival of the bun dreadlocks styles. However, the former is a bit more popular among men. 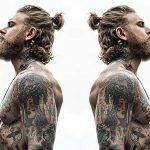 The thing is the man bun is still very controversial hairstyle because some people consider it an inclination into the feminine side. As for the man ponytail, there are no stereotypes as strong as this one. Embrace your creativity and try this chic look. 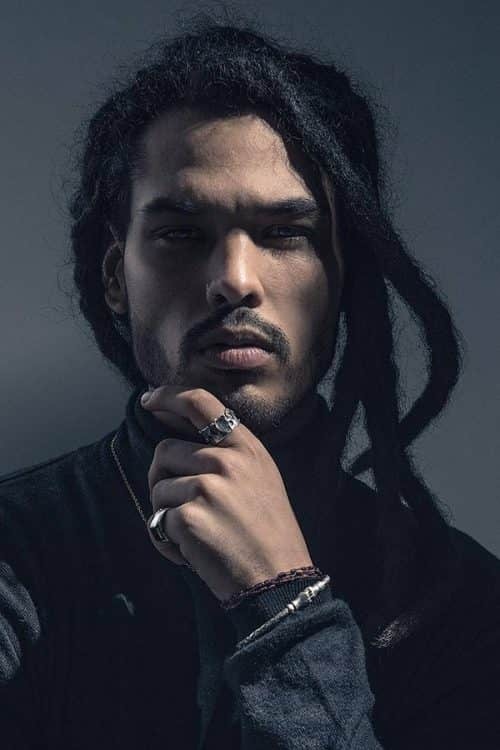 Dread styles for men can be fanciful and complex, like these braided dreads that add an exclusive texture and depth to the look. Just keep in mind that it’s much easier to deal with thinner locks because they allow you more precision. If talking about white people dreads won’t be the most common hairstyle among them. The main reason for this is probably that locs create a striking contrast with the fair skin tone. In case you find white people with dreads looking way too intense and unbalanced, try dying or bleaching your locks to get various colors. In this way, white dreads seem softer and more harmonious. On a side note, dreadlocks men often opt for nowadays are definitely on the edge. Even though there are tons of styling options, they continue to pop up every day, which makes us very happy. So enough depriving yourself of a really cool and stylish hairstyle and get yourself dreadlocks. Looking For A New Hairstyle For Your Long Hair? 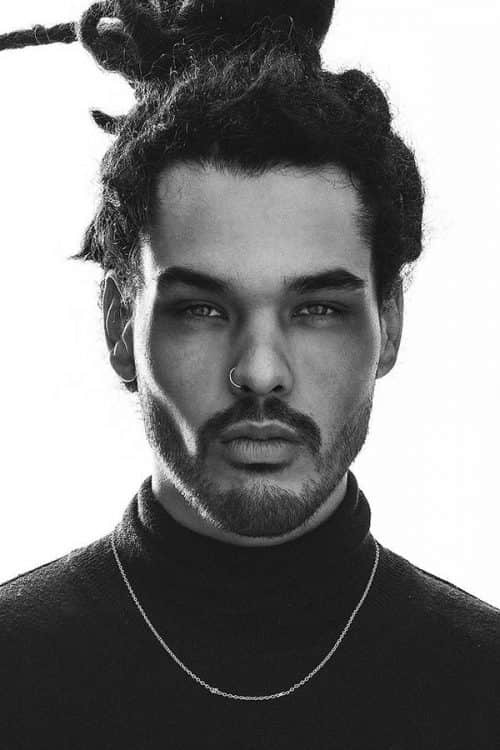 Check Out Our Photo Gallery Of Man Ponytail Styles!